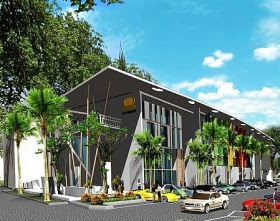 CP Land has lined up for launch this year three residential and commercial property schemes with an estimated gross sales value of RM1.7bil for the Queensbay project that would further enhance its reputation as one of the most prestigious addresses in Penang. Located on 73 acres freehold site in the south-eastern corridor of the island, the RM3bil Queensbay development comprises luxurious residential homes, shopoffices, signature office suites, corporate towers, serviced residences, business class hotels, a convention centre, a medical centre, marina, waterfront retail shops, and the largest and longest shopping mall in the northern region. “To continue developing high quality lifestyle properties for Queensbay, we are capitalising on its strategic location next to the sea, easy accessibility and matured surroundings for our new launches next year,” group executive chairman Datuk Tan Chew Piau says. “The three schemes to be launched next year are the RM500mil Bay Villas, the RM200mil Queens Wharf, and a yet to be named RM1bil integrated commercial precinct, which are all sea-fronting properties. CP group is one of the handful developers on the island with landed and high rise residential and commercial properties fronting the sea,” Tan adds. The Bay Villas comprises 86 units of three-storey waterfront and garden villas, while the RM200mil Queens Wharf is one iconic 10-storey building of 150 serviced apartments. The Bay Villas linked units have built-up areas of between 4,000 and 5,000 sq ft.
“The units have designs and themes irresistible to those willing to spend on luxurious living. “The units, with full sea view, are equipped with a roof top garden terrace, private waterfront garden, and a private infinity pool. 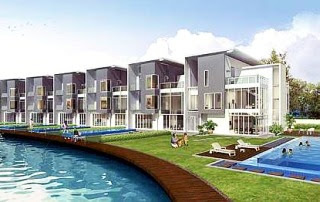 “The Bay Villas, scheduled for launching in the first quarter of 2008, will be priced between RM3.8mil and RM5mil,” he says. Targeted for launch in the second quarter of 2008 is the Queensbay Wharf project. The iconic building of 150 serviced apartments with facilities and concierge services, with built-up areas of 1,000 to 2,000 sq ft, has panoramic view of the sea, Penang Bridge, Pulau Jerejak, and Seberang Prai. “There will also be retail and food and entertainment outlets at the ground floor,” he says. The Bay Villas and the Queens Wharf projects are scheduled for completion respectively in 2010 and 2011. 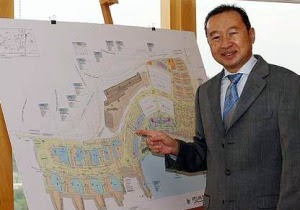 To be launched in the third quarter of 2008 is the integrated commercial precinct that has yet to be named, Tan says. The unnamed project is the single largest commercial development consisting of prominent retail outlets, a five-star business class hotel, equipped with a 2,000 capacity ballroom, four blocks of corporate towers and five blocks of super luxurious fully furnished serviced residences. Surrounding this unique commercial development is a waterfront promenade with viewing decks. “This business precinct, scheduled for completion in four years, will form Penang's new central business district on the island,” Tan says. The group's high-end properties, launched for the Queensbay project, have so far been well received by Penangites, who have the reputation of holding tight to their wallets. To date, CP Land has sold about 80% of the RM500mil residential and commercial properties launched since 2005. Tan says that about 80% of the purchasers are local, from Penang and neighbouring states, while the remainder are sold to foreign buyers. Tan says the group is getting more interests from Asian and European buyers who are making enquiries on the Queensbay properties. “We are attracting attention, as our properties are far more competitively priced than properties of similar range in prime locations overseas. The innovative designs and concepts of properties that were usually found in big metropolitan cities are mainly responsible for the strong sales of the Queensbay project, Tan says. For example, the Bay Capital, one of our current ongoing projects, comprising 98 corporate suites with built-up areas of between 983 and 2,955 sq ft, are column-free, and designed with a stunning granite grand lobby and an inspiring triple volume ceiling height. The units are equipped with en-suite private washrooms, private pantries, and are broadband ready. The Bay Capital is also a Multimedia Super Corridor (MSC)-compliant building. “Since its soft launch two months ago, the Bay Capital has sold about 60% of its properties, which are priced between RM350,000 and RM790,000,” he adds. Another example is the Bay Avenue's three storey shop offices which have high-ceilings, larger built-up areas between 4,000 and 6,000 sq ft, and are equipped with elevators. The ground floor is fronted by a landscaped boulevard, wide veranda and walkways, which is perfect for retail ventures. Every unit comes with convenient common lift access and broadband connectivity. “Bay Avenue has appreciated about 50% from RM940,000 some 18 months ago to about RM1.5mil recently, when one customer offered to buy a Bay Avenue unit for RM1.5mil,” he says. Tan adds that many of Queensbay's investors have also bought other types of property launched by the group for the development. “Besides buying our first launches in Queensbay, they also invested in other ranges of property planned for the new phases of the project,” he says. On CP Land forthcoming projects in Kuala Lumpur, Tan says the group is now planning a mixed-development project on a prime seven-acre site in the city. “We are in the advanced stages of finalising the details of the project, which will be implemented in the first quarter of 2008,” he says. Meanwhile, Henry Butcher (M) director Dr Teoh Poh Huat says the value of properties in Queensbay and the surrounding neighbourhood has appreciated between 20% and 30% over the past two to three years. Teoh says the Queensbay residential projects owed much of its success to the Queensbay shopping mall and the surrounding retail outlets and offices developed by CP Land. “Nowadays the trend is to look for residential properties that are close to the comforts of modern lifestyle living such as shopping amenities, entertainment centres, and food and beverage outlets,” he adds. CP group is planning an expansion exercise to add 400,000 sq ft of lettable floor area in view of the growing demand for retail space. The expansion exercise is expected to be implemented in 2009 and scheduled be completed in 2010. “The proximity of the Queensbay project to the Free Industrial Zone (FIZ) is also one of its selling points.